That’s the great thing about life that every human being is connected to something that’s bigger and more important than any other – we’ll never run out of significant things to do! The unnecessary essence can be checked off or forgotten about once it’s done. Everybody's purpose can be different for each of us and can change over time. Maybe it’s related to family, work, a cause or your community. If you don’t know what yours is, don’t believe for a minute that you don’t have one. Everyone does. Finding your purpose is like being the One. Being the One is just like being in love with whatever you are doing. So, when it comes down to it, finding your purpose is finding what you love to do, what you’re passionate and motivated about. This necessitates vulnerability and deep inquest. But most of all it requires determination and curiosity. To figure out what it is, the first step is to be honest – honest with yourself, honest with your loved ones and honest in an effort to match your life with your values. Your mission is already inside you. Go find one for yourself. Stay Motivated. 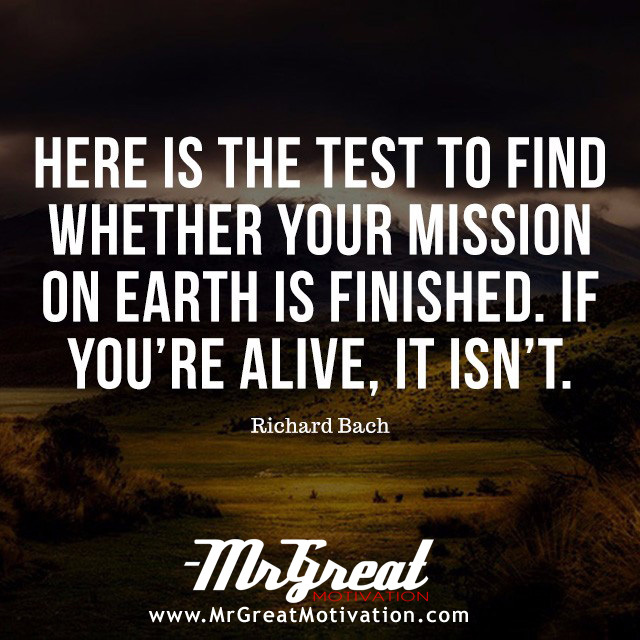 We hope guys you find Quote "Here is the test to find whether your mission on Earth is finished: if you're alive, it isn't - Richard Bach" by Mr Great Motivations useful. If you think we have made some efforts, then don't forgot to appreciate us by sharing this Quote with your friends and family, And thanks for visiting.